Know your own dish detergent baron, disinherited viceroy, or otherwise seldom seen swan you'd like to memorialize? Submit a character sketch by contacting Amy Wright here. When I was in my early twenties I asked my grandmother to teach me how to make a pie. She was known for her pies—apple, blueberry, pumpkin, mincemeat. I assumed I’d come away with a recipe, but as she worked in her little kitchen that Saturday afternoon, me seated beside her on her stepladder stool, she didn’t measure anything. She seemed exasperated when I pressed her to stop so I could try to estimate and record how much flour, how much water. “Honey, you can look up a recipe in any cookbook,” she said. “The measurements are all about the same.” A cigarette burned in the ashtray beside her. I put down my notebook and pen. My great-grandparents, Pappy and Mammy, moved from the mountains of East Tennessee, where houses were mostly black tar paper, down South to Pulaski, a foreign land with televisions and such. They lived in a bedroom in my grandparent’s house that had been the den, so they had a t.v. at the ready. 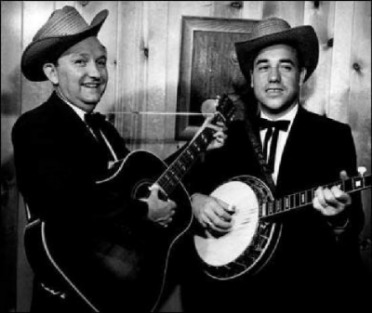 Mammy’s maiden name was Flatt, and she was kin to Lester Flatt somehow. She resented that he was in that box on Saturdays and would not speak to her. She would holler, “I see you, Lester. I know you see me, and you better speak to me!” This would go on for the entire half-hour program. I guess she died thinking Lester was the biggest snob in the Flatt family. She may have been right. Zada Duncan grew up in southern Tennessee, where rolling hills were filled with poverty and faith. She made friends with squirrels and kept her rifle sights set on old tin cans, not the birds and turtles her cousins liked to shoot. She even loved Mr. Holly’s ram, until the day she was walking home from the PartyPack, with a nickel’s worth of candy in her pocket, and he broke free of the fence and charged faster than her seven year old legs could run. He would’ve gotten her, but her daddy popped out from the shed and flung the file he’d been using with such force, the tip planted right between that old ram’s eyes, and dropped him cold. Zada still has a soft spot for animals, and her daddy will always be her hero. Bitt Rouse was the only one-handed fiddler I ever met. He played old-time ballads and mountain tunes, learned when he was a boy, and when he had both of his hands. The way Bitt lost his right hand must have been unimaginably painful. For six hours, he knelt beside a corn picker that had caught his shirt sleeve and pulled him into the machine, until a neighbor finally heard him calling for help. My father remembers working for his cousin Bitt when he was a boy in that same field, plowing with a horse for 50 cents a day. My dad thought that was good money in the late 1940s, especially for a boy who should have been in school. Bitt Rouse died at 84 years of age, on his way to unlock the doors of the restored one-room Rush Strong schoolhouse, where a group of local musicians played for a monthly barn dance. In cold weather, Bitt went to the school early, to get the wood-stove burning before the crowd arrived. He kept a kind of fire going in the old-time music he played, as well, like the hearth-fires brought across the ocean to the New World. Bitt tended the flame until his very end, and that seems like a good way to go out after 84 years. Luther Durham was my grandfather’s WWI buddy. He lived next door to my grandmother’s house, and by the time I was eleven, he was in his late seventies and needed help with his lawn. Under his watchful eye, I’d cut the grass and then water the garden from his rain barrel. He even taught me how to edge his lawn with a shop-sharpened corn knife. After we’d get done, he’d invite me up on the porch and his wife Katy, who he met in Germany, would serve us iced tea with lemons. We’d sit on the porch and listen to the ballgame and he’d tell me stories about where he grew up in Kentucky. He once caught a catfish that was so long it took four people to pull it out of the Ohio River. He said, “Boy howdy, that was the biggest catfish I ever saw!” It was the first time I ever heard anybody say, “Boy howdy.” My grandmother told me when he and my grandfather and their American Legion buddies would get together, they’d raise a glass to the fallen and sing “My Buddy” and “Long Trail A-Winding” and tear up.